Nice report Keith. Wish I'd been there! Got back at 0130 thios morning. Returned with stops in the Black Forest, another amazing biking area, and rest stop in Paris. Brilliant trip, nice to meet all who attended, the dolomites are amazing and I hope to repeat the visit. The next trip should be planned to avoid the weekend, we stayed an extra day in Val d`Ega and had a ride on the monday to Cavalese and returned by Vigo di Fassa, the roads were empty compared to Saturday. I will attempt to post some photos, though to appreciate the scenery you had to be there. 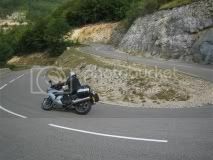 1) Travelling up oner of the passes on Saturday after lunch, in convoy, being passed one by one by a swiss ZZR1200 rider. He must have thought he was alone in the area , and suddenly passes a group of 9. the thought of this suprise makes me giggle. 2) The suggestion the Mr Sweary should be the voice of Tom Tom, I`m sure there is more to follow. The hotel staff are to be praised for their acceptance of our group. Segregated in a cosy dining area, they were kept busy up to the early hours, be repeated requests for wine and beer. THe other guests in the hotel deciding to retire by about 10PM. To all who attended, nice to meet you and YES we would like to see you again. To all who did not, make thye effort next time, it is worth it. First gear takes you to the limit. Colin & Jackie, good to hear you are home and had a good time. Hope to meet both of you again in the future. Mr Sweary should be the voice of Tom Tom, I`m sure there is more to follow. Back at last and it's bloody freezing !! It was a pleasure and a privilege to meet everyone that made it to Eggern and I think it safe to say that a good time was had by all. After the weekend 6 of us headed down to Tuscany for a week, then on to France for another week. Had a fantastic time, saw some great sights met some wonderful people, all in all a great experience. Total Mileage 3242 Door to Door. Tyres are about shot, especially the front which collected a bloody great staple in the tread whilst we were on the Riviera, but got me all the way back to the UK ( with the staple in situ ) and never droped a pound of pressure - thank you Bridgestone. I don't like . But it did make me read the thread again. I did not know it survived the upgrade of this forum. and in 2012 we are going back to the Dolomites.